Just as the wicked winter nights draw in earlier and earlier so does the premature tattle surrounding the Oscars, usually which Hollywood A-lister is to saunter down the red carpet clutching the little golden man for best actor. One of the favourites for next year’s prized accolade is all-round nice guy and highest grossing box office star ever Tom Hanks for his part in Captain Phillips. Media hype has been overwhelmingly positive for the suspense filled drama with Mark Kermode going as far as to call say Hanks put on the “performance of a lifetime”, so just how does the film actually hold up under Jonny Smith’s scrutinising gaze? Rather badly it turns out. Inspired by the big bad real world we reside in, Richard Phillips is the most unfortunate captain of cargo vessel Maersk Alabama that runs into a sea of peril off the coast of Africa when it’s targeted by a motley crew of Somalia pirates. Captain Phillips comes up against his opposite number in Abduwali Muse (Barkhad Abdi) resulting in the latter kidnapping the former as a bargaining chip to negotiate millions of dollars from the US government. The subsequent film is a stand offish hostage negotiation special aboard the uncomfortably cramped confines of an escape vessel, tensions rise between the captains, Muse’s men and the strained US Navy leading the charge to rescue Phillips. What follows should be a heart stopping, gritty and emotionally draining rollercoaster ride centred on Phillips’ uncertain fate, yet what is served up by director Paul Greengrass is anything but ambiguous. 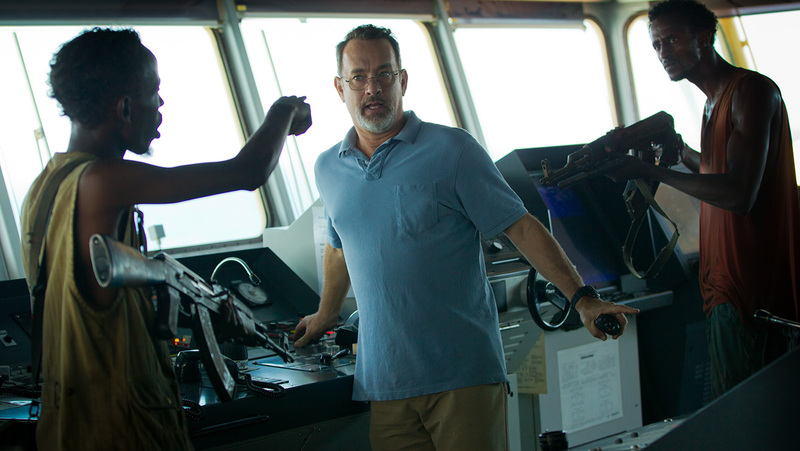 Formulaic to the extreme, whatever preconceptions are fathomed about Captain Phillips pre-screening it’s likely that they will all come true come the film’s dreadfully dreary conclusion. It’s a disappointingly predictable outcome for a film that lets the tension drag for over two hours, a promising unauthorised boarding of the Phillip’s ship sets up the butter knife cutting atmosphere but it soon stagnates after bring lost at sea for too long. Perhaps it’s the 12A rating or the fact Tom Hank’s is the star which forebodes a less than graphic, raw and violent tale. Moments of heart racing suspense, that would impress the most sadistic horror lover, become underwhelming after the initial pirate clashes, purely down to the fact we know there are no grave consequences to the hollow threats, shouting and gun pointing that makes up large parts of the dialogue. From the director who brought us 9/11 faux-documentary drama United 93 it’s unsurprising that Captain Phillips has a vehemently pro American standpoint. Towards the middle of the film when captive Phillips is stuck with Muse’ gang a rapport is stuck up between the respective leaders. Phillips tentatively asks why the Somalia native can’t be more than just a fisherman or a pirate to which the he replies “Maybe in America, Irish, maybe in America”, an indictment of the grim realities of life in Africa. This attempt to blur the lines between good and bad is never explored beyond this brief exchange, sympathises that manifest for Muse’ desperate life are quickly tossed aside as it becomes apparently clear that Phillips is good, Muse is a villain and America’s world police is the ultimate hero. Parallels between the two captains are hinted at, as are connotations with the under pressure Navy rescue coordinator (Yul Vazquez), without ever being pushed enough to warrant noteworthy theme, rendering their place ultimately pointless. Intriguing themes that would permeate the straight forward story are neglected leaving no deeper meanings to ponder beyond the film’s running time. In order for a hostage film to succeed there needs to be a high level of emotional attachment to the captive, we, the audience, have to care if he lives or dies in order the for plot axis to flourish. 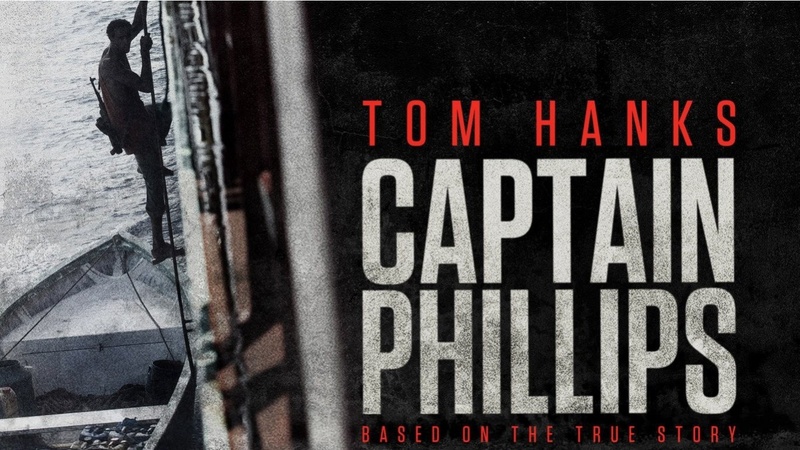 Captain Phillips’ problem is that Captain Phillips isn’t very interesting despite a strong performance from Hanks, the final third he really comes into his own. Our protagonists is billed as a family man, without ever seeing his kids and less than a glimpse of his wife, as well as obsessive professional at work highlighted by his harrying of his crew on their coffee break. Phillips is as straight as ironing board and marginally more interesting; the idea that he is the everyday man caught in an extreme situation backfires leaving him depicted as a stuffy, middle aged pen pusher who fails to garner enough excitement or attachment to make his plight a transfixing one. Considering the film’s faults it’s filmed in a polished approach that leaves little to question, the handheld docu-drama filming fits well in the true to life plot that Greengrass angles for. Scenes are naturally lived with insanely poky escape vessel enough to push the viewer into a jabbering wreck along with its crew. Additionally the acting is above passable, Hanks and Abdi being the only real actors of note in regards to plot and script, in what is a dearth of meaningful dialogue. With the filmmaking and acting crafted in the most professional category how can a film subside to mediocrity with such little ease? Rather than being the juggernaut of a cargo vessel pounding through the Arabian Sea Captain Phillips come across as modest tug boat chugging up the river Mersey, venturing out to sea-leaving no impression and quickly forgotten in the busy sea port. The actors are classy, matched with accomplished and confident direction but conservative American cinematic convention reigns supreme, thus sucking the excitement, value and memorability out of proceedings. Hank’s admirable Oscar appeal may well sink with the film’s mediocrity.